We love to travel just as much as our clients. Check out the map and see some of the places we’ve traveled throughout the world. 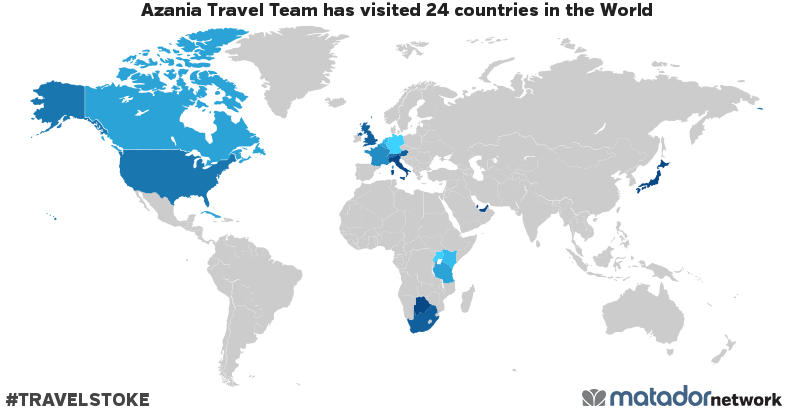 Azania Travel Team has been to: Aruba, Austria, Belgium, Botswana, Canada, Cuba, Curacao, France, Germany, Italy, Japan, Kenya, Luxembourg, Netherlands, Qatar, Sint Maarten, South Africa, Switzerland, Tanzania, Uganda, United Arab Emirates, United Kingdom, United States, Vatican.